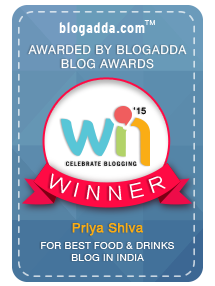 We were recently invited for a blogger meet hosted by GRT Hotels and Resorts. All the bloggers grouped at Radisson Blu Chennai and we continued our journey towards Mahabalipuram after a great lunch at Salt.CO.531 Kitchen & Bar. 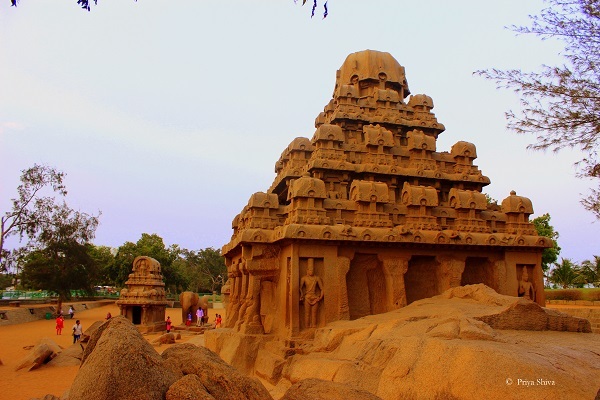 We were exhausted by the heat in Chennai and totally drenched in sweat by the time we reached Mahabalipuram. 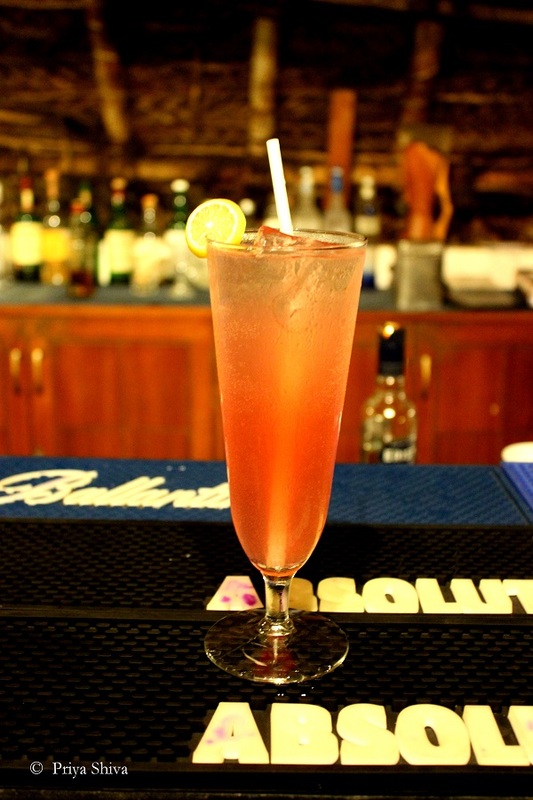 So, the only thing we looked forward was something cool, refreshing and chilling to relieve us from the heat. 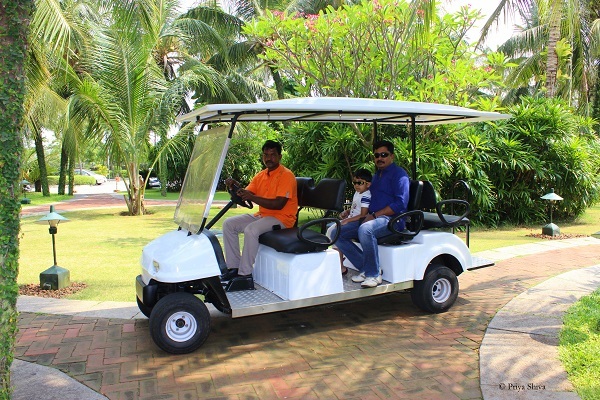 As we entered, the vast expanse of Radisson Blu Temple Bay Beach Resort by GRT Hotels and Resorts set the tone right for what we were going to experience over the next two days. 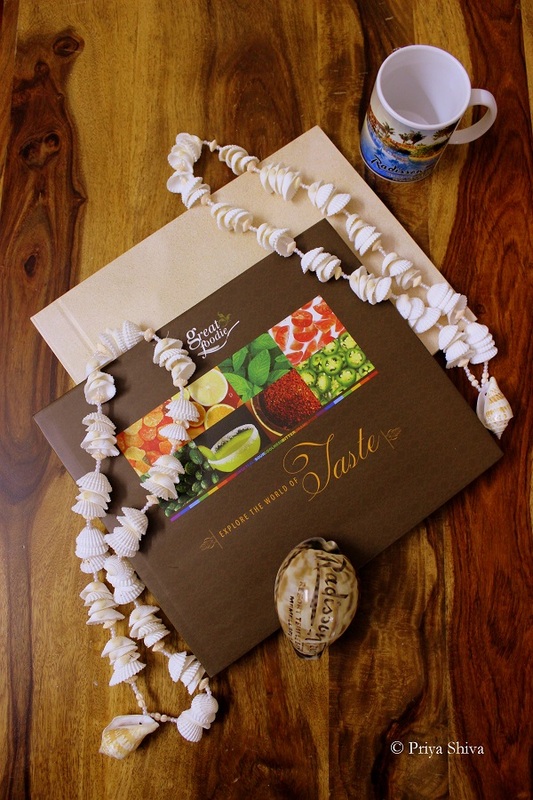 We were welcomed with sea shell garlands which gave us the feel of being in Hawaii and were offered coconut water as welcome drink that provided the much needed reprise from the Chennai heat, it not only quenched our thirst but also refreshed our tired souls. After the pleasantries we were taken on buggy vans to our rooms which were beach facing and to say that the view left us spell bound would just be an understatement. 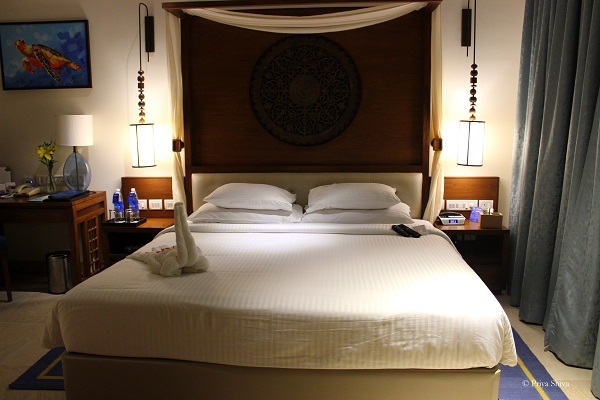 The room was spacious with all luxury facilities like big bath tub, air conditioning with individual temperature control, Color Televisions with Satellite Connectivity, coffee and tea making facilities, free wireless Internet access, resident Bar with assorted snacks etc. 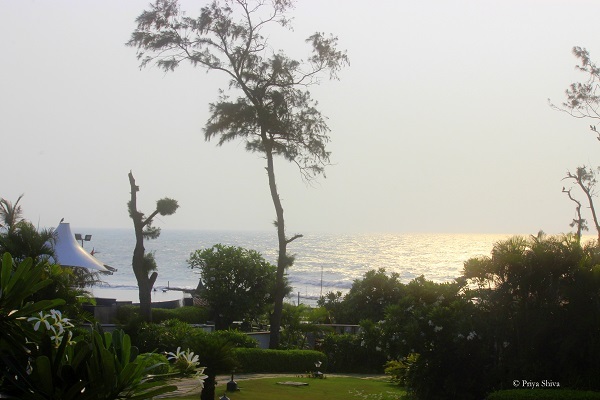 The room which we were given was facing the sea with a private patio which opened in the green lawn and had a view that one could drool for. That’s the view which we enjoyed from the private patio. We could sit there for hours doing absolutely nothing and watch the sea. It is that beautiful and mesmerizing. 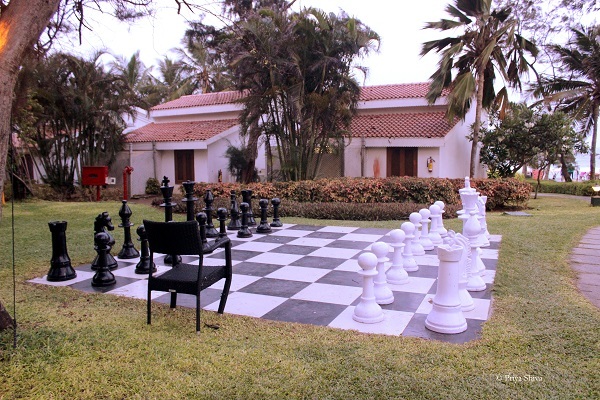 You can indulge in stylish rooms, cottages or villas at Radisson Blu Temple bay resort. 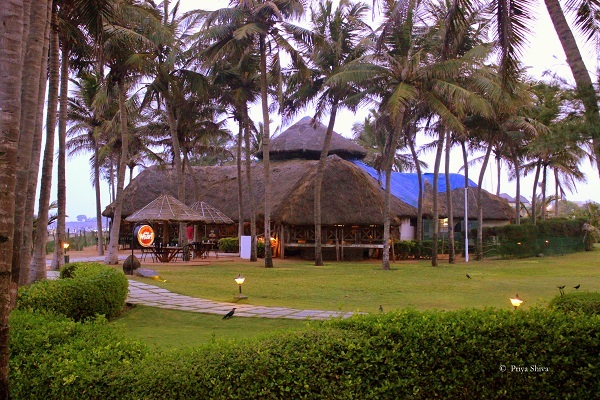 The resort has it own private beach and far from the hustle bustle of the city. Radisson Blu Temple bay by GRT spread over 44 acres is very popular for its destination weddings where people walk down the aisle on the beach, and create memories for life. With a view like that, we could easily say marriages are made in heaven. Dinner was arranged by the infinity pool side garden which faces the sea. We quickly freshened up and joined the fun. The fun doubled as GRT had arranged for DG music. The sea breeze and the food was enough to give us the energy to dance all night. . As the day ended, we returned to our room to wake up early next morning for a Cataraman ride.. The see was rough in the morning and unfortunately we could not go for the catamaran ride. 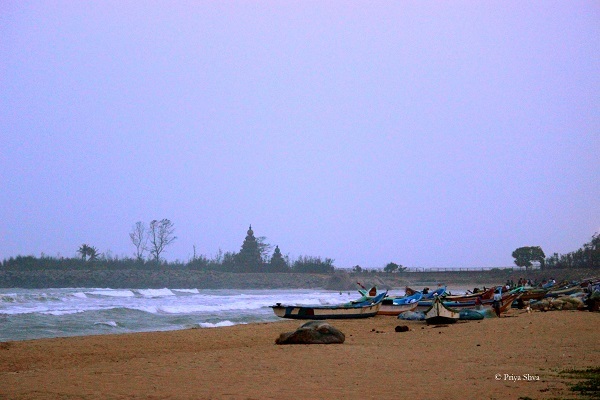 We spent some time at the beach and learnt that Radisson Blu Temple Bay By GRT supports “Save Turtle” movement and let the fishermen at the sea coast take the tourists for catamaran rides. It felt good to know that a brand connects itself to good causes too. We finally decided to take a dip at the infinity pool before we proceeded for breakfast. The best part about Radisson blu temple bay infinity pool is that it faces the sea. So, you actually get the feel of being at the sea while in the pool. 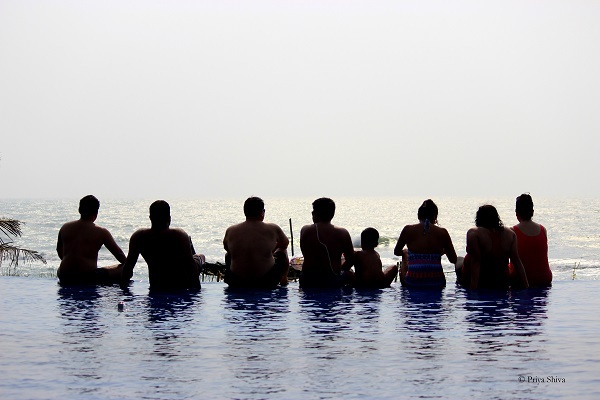 The whole gang had super fun by the infinity pool before we all got hungry and decided to go for breakfast. 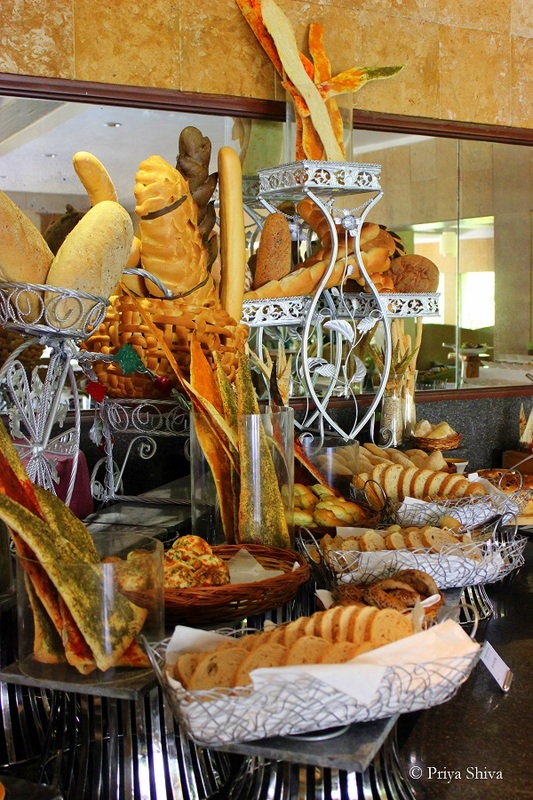 We were famished and delighted by the spread of breakfast at Water’s edge Cafe. The cafe overlooks the resort’s huge 27,000-square-foot pool and one can enjoy fine dining experience there. We had both lunch and dinner at this cafe and loved it. 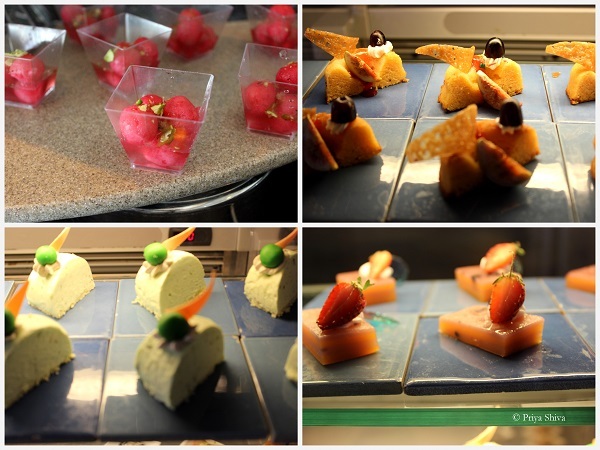 The spread is absolutely vast and almost has close to 16 varieties of desserts to end your meal. The options for both vegetarians and non-vegetarians is literally unlimited and for the men with appetite is voyage of culinary delight. The restaurant serves global cuisines. So, you can enjoy anything from an Italian pasta or Dum Biryani or delicacies from the grill like kebabs, grilled fish etc. Even the kids can enjoy their favorites like pizza or ice cream. We were lucky enough to check out Chef Vijay kitchen. 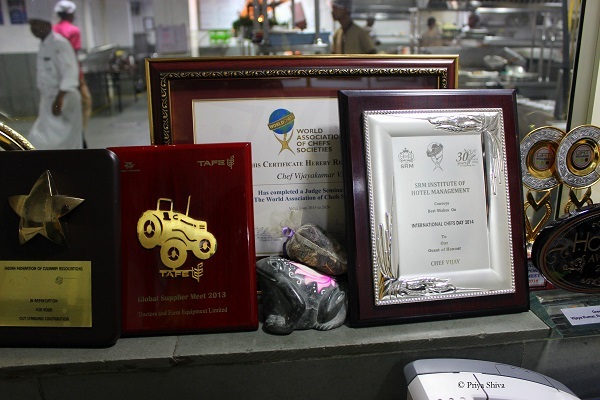 His passion for food flows in every dish which comes out of the kitchen and the warmth flowed as he talked about his team which has won him many accolades. 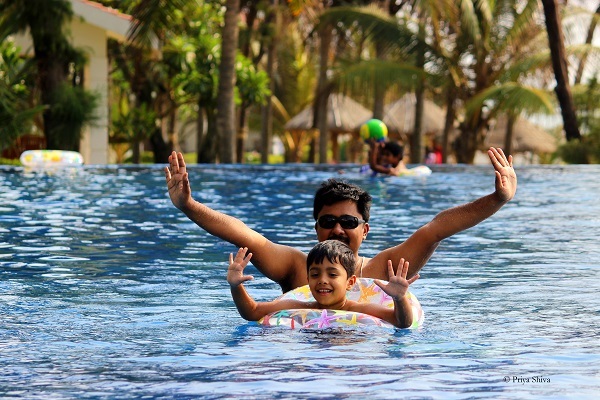 Radisson Blu Temple Bay by GRT is a place for your whole family. 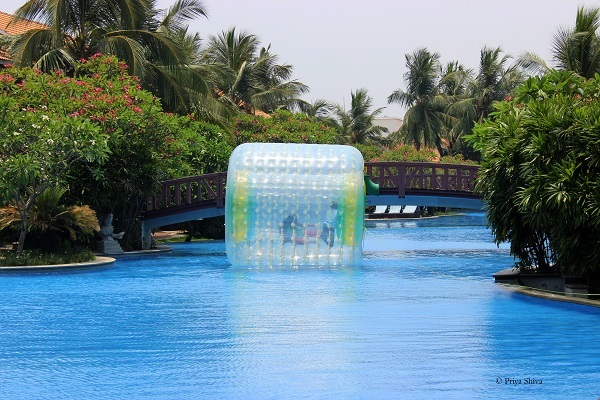 You can engage yourself in various activities All-terrain vehicles, Archery, Basketball, Beach volleyball, Cycling, chess or even zorbing. We are kind of people who might just spend the day being lazy in the room or sitting in the pool. You can even exercise with a personal trainer at their well-equipped gym. If activities drain you, go and pamper yourself with a spa treatment. 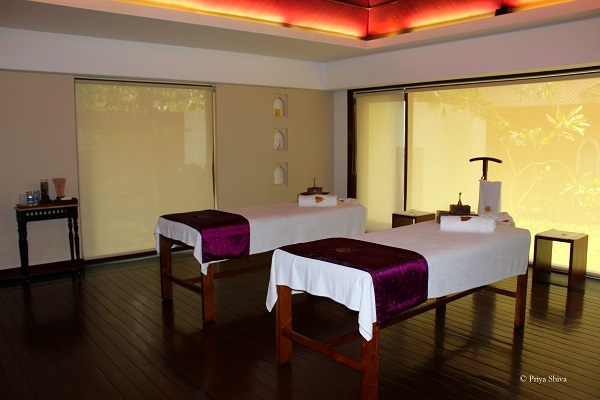 We could have gone for a couples treatment but Shiva chose for an Ayurvedic massage at the Ayush Ayurvedic Therapy Center . Shreejith, the therapist at Ayush is well versed in the pressure points and his knowledge of ayurveda is impeccable. The ayurvedic spa had a special treatment for Shiva’s frozen shoulder called heat fermentation, which had a mixture of White chaste tree (karunochi) , Ricinu sommunis ( popularly known as castor) , amala powder, drumstick leaves and tamarind leaf , which was fused with hot ayurvedic oils and applied over painful knots. 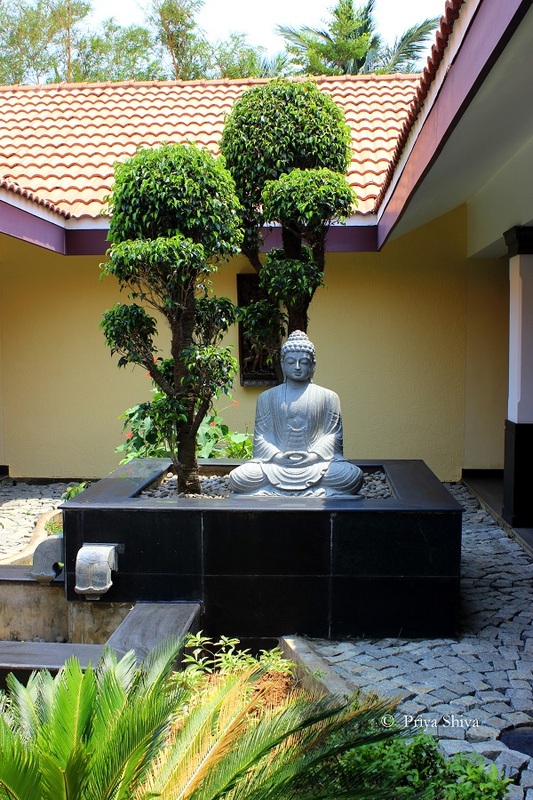 I went for a de-stress massage at Bodhi Spa. I tried “Mohini” which is a body massage with Haritkyadi Thaila and a tribal mud-masque that helps in eliminating cellulite and lymphatic drainage from the body. The 90 minutes massage therapy definitely left me rejuvenated and refreshed. 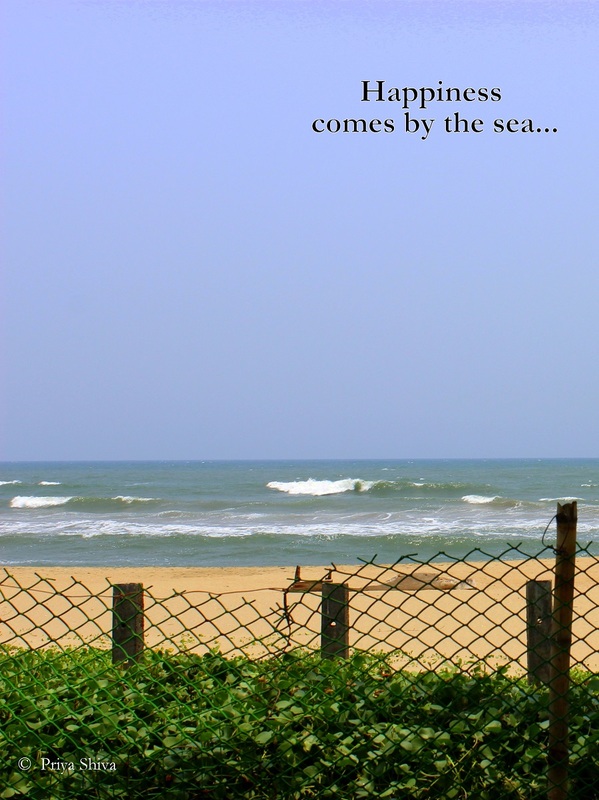 Radisson Blu Temple Bay by GRT is a beach resort located in Mahabalipuram which is around 65 km drive from Chennai. This town is an acclaimed ‘World Heritage site’ with centuries old historic monuments and temples.So, our evening was spent in sightseeing. Our first stop was at the Shore temple. It is believed that there are seven magnificent temples what are known as the seven pagodas built near the sea shore. Only one of them is visible now and rest are claimed to be submerged in water. 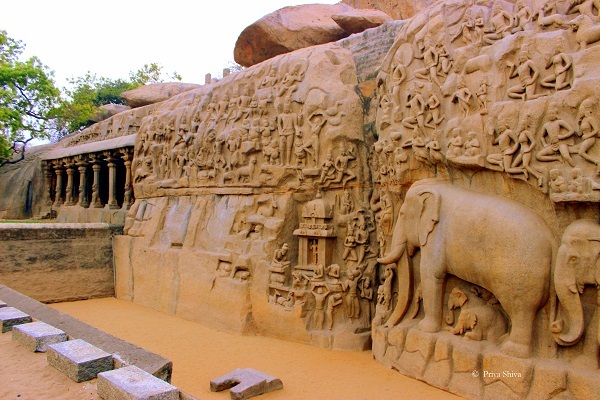 These were built in 7th century by Pallava dynasty and is an UNESCO world heritage site for its architectural splendor. The next stop was at Panch Rathas. 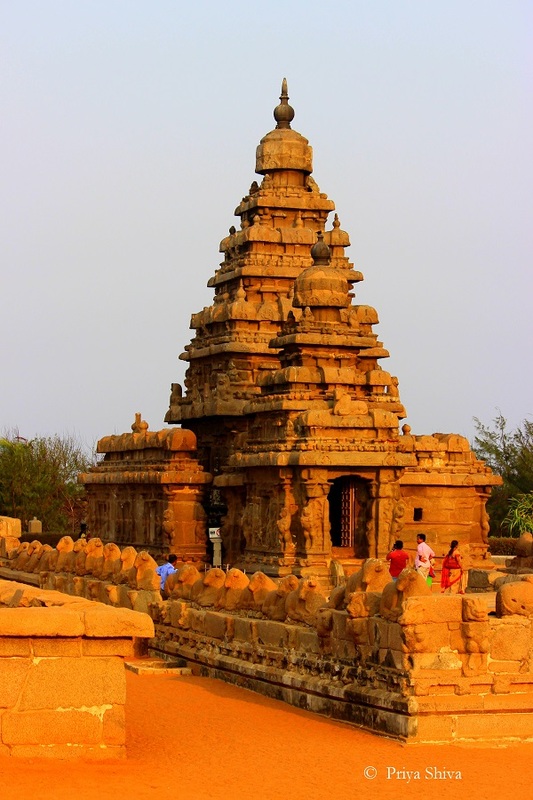 The five Rathas are a set of beautiful monolithic rock temples. Each ratha has been carved on a single stone. The Rathas depict the great epic Mahabharata and it is also known pancha pandava rathas. The five rathas are Draupadi’s Ratha, Arjuna’s Rath, Nakul – Sahadev’s Rath, Bhima Rath and Dharamraja Yudhistar’s Rath. Our next stop was at Krishna butter ball. 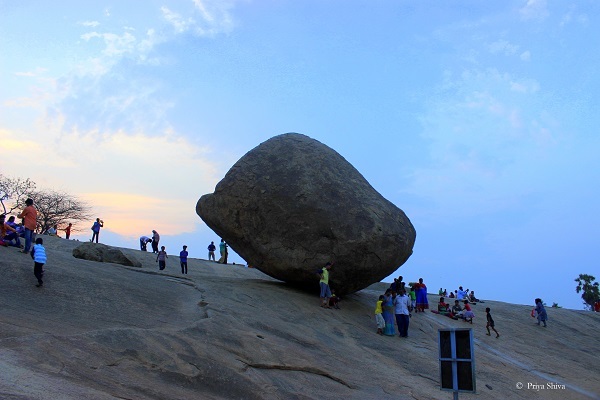 The 20 feet high and 5 meter wide rock estimated to weigh over 250 tons seems to pull off a balancing act which cannot be explained even by scientists. It is believed that in 1908, Governor of Madras Arthur Lawley thought of moving the boulder as it might be dangerous for the nearby homes. Seven elephants were employed to push the rock but to everyone’s surprise the rock couldn’t be moved and the task was abandoned. 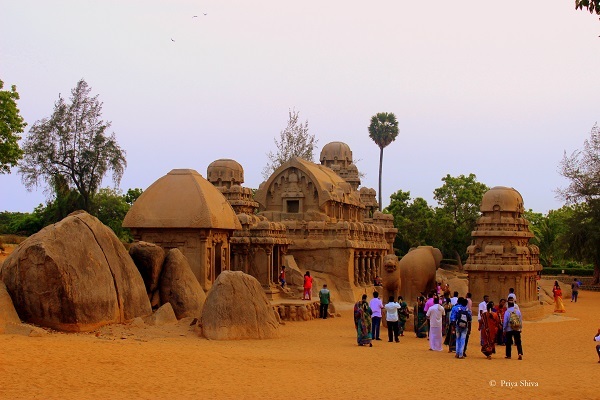 Mahabalipuram trail route was arranged by Radisson blu temple bay by GRT and and we had a knowledgeable guide to tell us the stories. So, the evening was well spent thoroughly enjoying and knowing the history behind these monuments and felt enriched by the heritage of India. 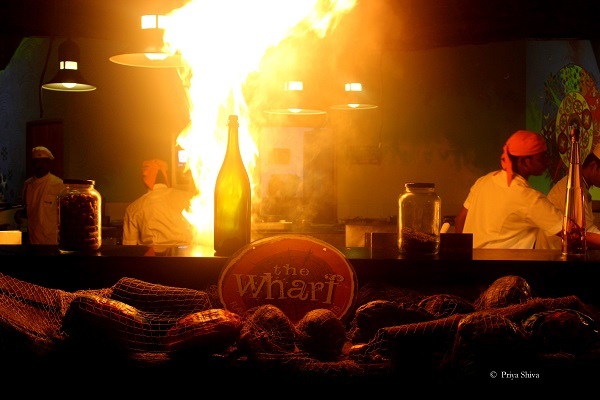 As the sun dawned, we returned to the resort to enjoy a relaxed evening by the Wharf. As vegetarians, we skipped the prawn skewers though they looked absolutely visually enthralling as much as they must have pleased the mouth of those who relished it. 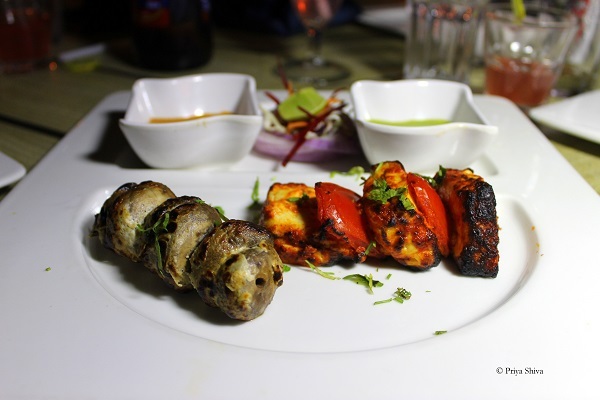 We especially loved the Achari Paneer Tikka which is the cottage cheese marinated with pickle spices and cooked in the clay oven. Daasten e kumbh which was a dish made with fresh button mushrooms stuffed with cheese and spice was also delightful. I love pesto sauce! 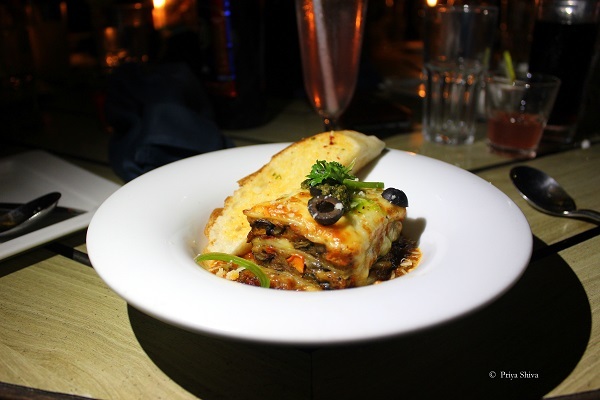 So, I totally enjoyed the grilled vegetable lasagne with pesto basil pomodoro served with garlic bread wedges for the main course. The dessert platter was even more beautiful with few of my favorites. 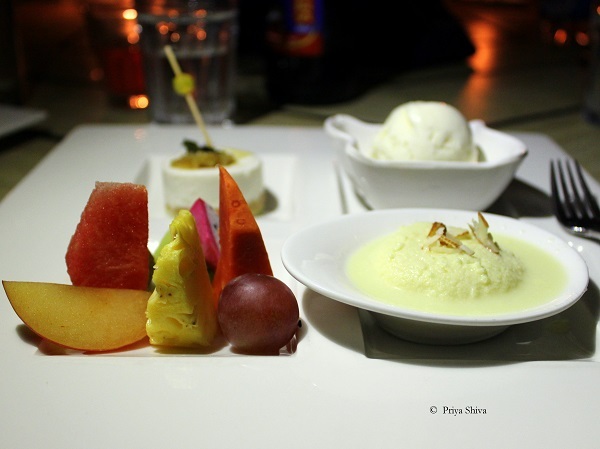 Now, who can resist or say no to Rasmalai which melts in your mouth.. The next day we moved towards Kanchipuram and had to say Good bye to this beautiful place. We moved on with a heavy heart but only after capturing all the beautiful moments which we will be cherishing for life. We totally loved our stay at Radisson Blu Temple bay by GRT enjoying the beach, hospitality of GRT management and fun activities. You all can click here to check out more info about them and plan your holiday there. Don’t forget to share your experience with us :)..
We are signing off today but we will be back soon sharing about our journey towards Kanchipuram and details about other properties of GRT hotels. So, stay tuned :).. Very well written post. Brought back all sweet memories of our stay at Temple Bay. 🙂 Must say you have clicked some great pics. Very well written Pri. Loved all the pictures. 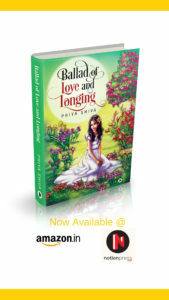 Beautiful piece Priyaji ! The photos are amazing, I’m sure you had a great experience ! Wish I could have joined the experience too.